Are you a real designer if you didn't graduate from design school? With so many ways to learn about design and so many designers describing ourselves as “self-taught”, do you need a special piece of paper from a university to prove you are a designer? If you scan a design job board, you will still see occasional job postings that list a degree as a requirement. Apparently it matters to some people. And there’s always that nagging doubt: maybe there is something that people with design degrees know that you don’t because you are self-taught. You have this worry in the back of your mind that people think less of you because you don’t have a degree. Many designers do describe themselves as “self-taught”. It’s a catch-all term for people without the special piece of paper. And I hate that term because it implies that those designers are somehow lesser than those of us with degrees. In the design profession, a degree means nothing. For me, a design degree has always been a weight around my neck: a student loan to pay off and a line on my resume to disclaim because the design program I graduated from just wasn’t very good. Having that piece of paper did allow me to apply for certain salary jobs during my career. But after I landed jobs that were supposed to require a degree, I met other designers at those agencies who hadn’t attended design school. They didn’t have the special paper. They got hired by having great design portfolios, and it was clear that I never needed a degree to apply for those jobs even if the job posting said so. My degree cost vastly more than the paper it is printed on but its value is zero. Having a design degree did not open doors for me. My university did not help me get a job. My professors were not networked with employers or able to advise me about what I needed to do to get hired. The only thing that opened doors for me was having a solid portfolio. The only paper that mattered was each page I could fill with great design. And I know that even if I had attended a better design school that could have set me up with opportunities, I still would not have earned them without a great portfolio. But many new designers don’t know this, and because of it, they can end up feeling like imposters. Imposter Syndrome means feeling like you don’t belong or fearing being exposed as a fraud. In the tech industry, Imposter Syndrome has become an offbeat buzzword of sorts. The fact that articles about Imposter Syndrome are so popular is proof that a lot of people in our industry are feeling like they don’t belong. 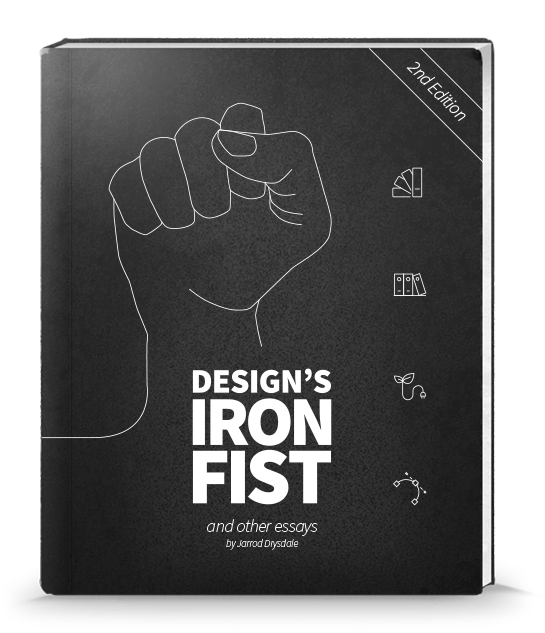 Many new designers feel there is a secret handshake or unwritten law about becoming a respected designer. There are parts of the design industry that prize academics more than might be equitable and look down on “self-taught” designers. Many of these academics stand on tall platforms, and new designers hear them. On the other hand, more and more designers claim being “self-taught” as a badge of honor. It’s like the punk rock DIY aesthetic. These designers prize independence, self actualization, and carving their own path like a protagonist from an Ayn Rand novel (if maybe with different politics). And new designers are hearing their voices too. However, when someone asks whether they need a degree, we fall down the rabbit hole again and face that same old existential crisis: what is a designer? Perhaps all the different opinions are fueled partially by the fact that “designer” is a label anyone can claim. A designer is just someone who designs, and that can be anyone at any skill level. We weigh the value of design degrees against the virtues of being self-taught, and in doing so, we forget to keep speaking the only message that new designers need to hear. It’s a message that we senior designers have heard so often that we believe everyone knows it already. But new designers still need to hear it, and it’s our job to keep repeating it. Your design portfolio is all that matters. No one will question the way you learned when they see what you can design. They only care about what you can do. So don’t call yourself “self-taught” or a “design graduate”. Those labels don’t matter and won’t open any doors for you. Further, no piece of paper, employer, institution, or person can give you the right to design, because you already have it. Don’t worry about whether you need a design degree. The only issue you need to worry about as a designer is the quality of your work. Just make design, continue growing as a designer, and let your design speak for itself. Your design work will open more doors for you than a special piece of paper ever could.